For our latest work with Sheraton Grand London Park Lane, we’ve gone back to the hotel’s 1920’s roots to help them showcase the art-deco masterpiece that is the Palm Court. The Palm Court is the beating heart of the hotel, providing guests with a fine spot to eat, drink and unwind, against a back drop steeped in history. So we decided to head back for this little number. At exactly 19:20 (see what we did there?) 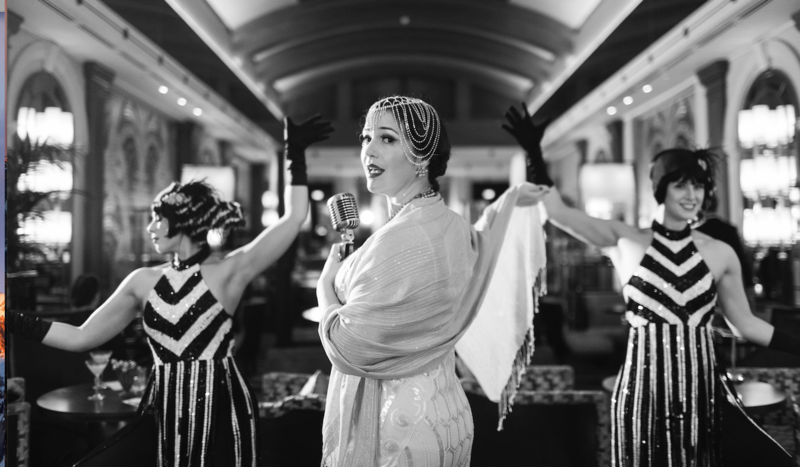 every Wednesday evening the lights dim and mood changes, as the Palm Court is bathed in all the decadence of the Roaring 20’s, for a single – and very glamorous – hour. Under a single spotlight a singer performs classic 20’s hits, dancers work their way between the tables, the bar staff step out of their Sheraton uniforms and into era-specific garb and classic cocktails are served in 20’s glassware. It’s a simple idea perfectly suited to the space it’s designed to showcase, and it seems the media agree too. Following last week’s launch in front of a room full of media, we’ve already seen coverage in the likes of Evening Standard, standard.co.uk, The Handbook, The Mayfair Times, the Spirits Business, The Resident, All in London, Country & Townhouse (on two occasions), Hello!, Get West and Delicious. Given the evening runs each and every Wednesday into 2019 and with LOTS more in the pipeline, we’re expecting stacks more to land. Celebrating a year of Switched On! WANT TO BE STANDING HERE WITH US? WE'RE HIRING.